“What I have seen is, be it music or life, Swami always wants purity and perfection,” Mr. Eradi goes on to explain with examples, “In music He is extremely particular about shruti, talam and bhavam. In fact during one Onam celebration in those days, as the music programme was going on, there were two artistes on the tabla. However there was mike for only one of them. After some time Swami looked at the tablist who did not have a mike and said ‘shruti is not proper’ and advised him to stop playing. “After the session was over when we checked the tabla, it indeed was not in perfect shruti but the variation was too minor. We were amazed! Even though there was no mike on that tabla and there were so many things going on during the performance, Swami was uncomfortable with that hairline gap in shruti. Actually none of us felt anything was odd even though we were sitting there, right under Him. That is how sensitive Swami is to shruti. 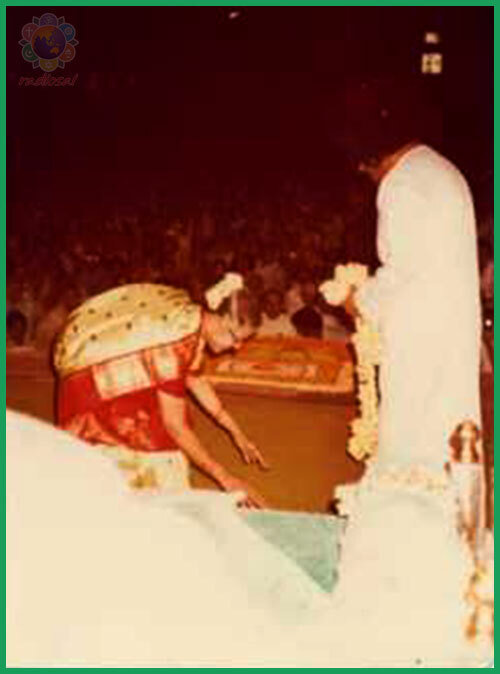 “Similarly, on another occasion, Swami called Mr. Mohan Rao who always used to lead the bhajans along with many others during the early morning nagarsankirtan sessions, and said, ‘While you were crossing the canteen gate during nagarsankirtan, one of the boys in the group was not singing in proper shruti. Ask him to practise well and sing after six months.’ Mr. Mohan Rao was stunned because in a nagarsankirtan so many sing together and if one person is slightly off-key it would hardly matter or get noticed, but nothing escapes the notice of Bhagawan, especially when it comes to purity in bhajan singing. “This is how an authority in Carnatic music felt in Bhagawan's presence. The Divine Musician of the Three Worlds could have had anyone sing for Him but it was His sheer compassion that He gave opportunities to people like us. In fact, in those days we were blessed with so many chances that it almost made us feel indispensable to Prasanthi. "My students will sing for Me..."
“In the '60s bhajans used to happen from 11 to 12 in the morning and 7 to 8 in the evening. Rest of the time Swami would be busy giving interviews. Everyone who came was called. If it got dark in the evening Swami would get a lantern along. There were hardly any singers then. It was us whenever we were there, along with Mr. Mohan Rao and Mr. Raja Reddy who was His personal servitor. “When we heard this from Swami then, we felt ‘Okay, we can understand musicians coming here. But why will students come here?’ This was in the sixties. That a university would come up here was beyond my wildest imagination then. But that is what eventually happened. There were so many student singers in the later years that even though they were singing in pairs, many would not get an opportunity even once a week. What a prophetic revelation it was! But we in our limited minds could not grasp anything of it then. “There was another such profound moment in the seventies. One day Swami asked all the ashram inmates to assemble at 2 pm in the bhajan hall. On His instruction all the doors and windows were closed. 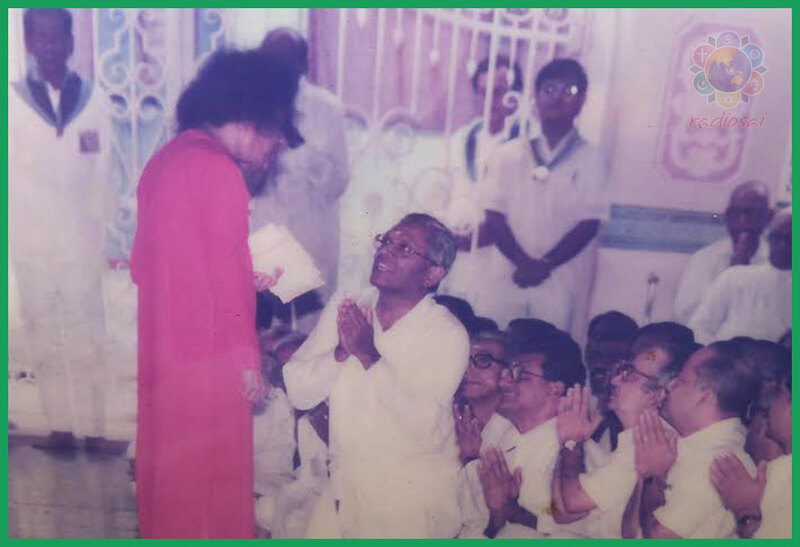 Swami asked Mr. Kutumba Rao, the caretaker of the ashram then, to speak. The respected elder gave everyone a bitter dose for their betterment. We may have seen many multi-coloured peacocks but a completely white peacock is not easy to sight. There may be hundreds of bamboo in the wood but the ones which transform into lucid flutes are few. Similarly, there may be several who have had the opportunity of proximity with Swami in His 86-years-long earthly sojourn, but souls like Mr. Krishnadas Eradi are rare. Just like the peacock feather picked by Krishna is meant to enhance His charm, specially crafted instruments like Mr. Eradi are created to add to His glory, enrich His music and leave eternal footprints in His Story. Now it is for the succeeding generations to make use of these footprints and discover their way to fulfilment and peace.